International Yacht Collection has been in touch to tell us that it has taken over the Central Agency for the sale of the superyacht O’Khalila. Built in 2007 by Palmer Johnson, O'Khalila has two complete deck areas plus a raised pilothouse, which blends into an extensive open-air deck. A modern interior by Nuvolari-Lenard accommodates 12 guests in five staterooms, including an enormous master cabin (with four large windows on each side). O’Khalila offers impressive performance, with three 3,650hp MTU engines powering her to a cruising speed of 30 knots and a top speed of 34 knots. At more modest speeds she has a range of 4,500 nautical miles. A popular charter yacht, she has full MCA compliance. 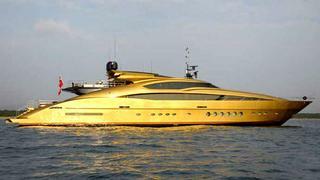 Lying in Monaco, and asking €10.5 million, O’Khalila can be viewed at anchor during the Monaco Yacht Show.